Individually, many agencies and organizations serve one dimension of children’s well being, from immunizations to early learning programs. Embracing the idea that we must nurture the Whole Child requires the entire community working together. A child who is fully immunized but spends the day without stimulating educational experiences will not realize his full potential. Similarly, a child who has quality child care, but an unsafe home environment may never become all she could be. Ultimately, our community will pay the price for failing to fully nurture the treasure that is our children. At Whole Child, we view services and programs as a continuum of care, not as isolated services. It’s this holistic approach to addressing care that makes all the difference in achieving positive outcomes for you and your child. 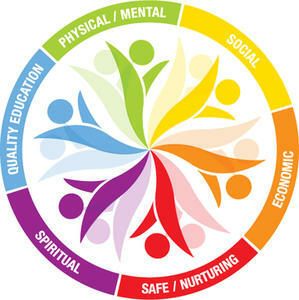 It is the integration of the following six interactive dimensions that make up a WHOLE CHILD. Physical and Mental Health means more than the absence of disease. Health is active, alive and vital. It is the presence of well-being and dignity in the lives of children and families. Social Interaction and Competence: The building blocks for successful relationships and a healthy sense of self begins when a child is an infant. Emotional skills, such as confidence, curiosity and a sense of relatedness are critical elements in a child's ability to interact with others. This includes playing and developing relationships with peers, interacting with caregivers and parents, adapting to a variety of environments, and learning about the larger world. Quality Education: It is no accident that children's minds are compared to sponges as they soak up the world around them. Parents are their first and most influential teachers, whether it is in everyday educational moments or choosing the right child care program. Use this Whole Child site or fill out the Whole Child profile to find as many tools as possible to help you create and seek out environments rich in stimulation for your child's growing mind. Safe and Nurturing Environment; a safe home, a safe neighborhood, a safe park and green space to play and interact with family, friends and neighbors connects children to a larger world and builds a foundation for a healthy community. Personal health depends on environmental wellness too. Spiritual Foundation and Strength helps a child develop the sense that their life is meaningful and has purpose; that ethics, values and morals can guide them and give them meaning and direction. Economic Stability: Economically stable families have: a lower rate of divorce; a lower rate of domestic violence and abuse; a lower likelihood of chronic illness; children who are better prepared for school, more likely to stay in school and continue higher education or training; and children who are less likely to have children out of wedlock.